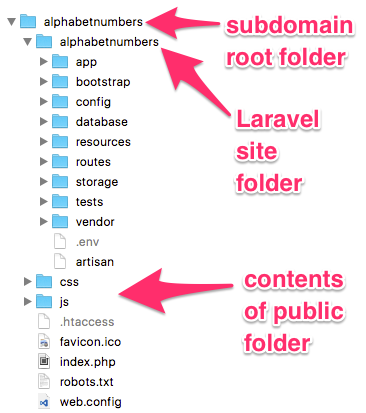 Running Laravel 5 on a shared host subdomain (I use Vidahost) is a little daunting because Laravel requires the web root to point to the /public folder and generally with a subdomain the website root is the root folder that is created for you. My solution was to create a directory in the subdomain root folder and copy all the code into there. I then copied the contents of the /public folder into the subdomain root folder and edited index.php. The two require lines need modifying to remove the ‘..’ characters and replace with the actual path. It’s not pretty but it worked OK. The little application I wrote is to help with non-verbal reasoning tests, to memorise the numeric equivalents of the alphabet: Alphabet to Numbers.